In ancient Pompeii, if you walk northeast along the wide Via dell’Abbondanza, then cut right onto the narrower Via Nocera for a block, then turn left onto Via di Castricio, you’ll approach the southeastern corner of the city, where the road again opens wide to the Anfiteatro, Pompeii’s stadium, preserved remarkably well by the thick blanket of Vesuvian ash that covered it for about 1,700 years. When G. Keith Still took this walk for the first time nearly 11 years ago and went inside the stadium, he sensed a paradox. In many ways it felt just like modern stadiums. That’s not surprising; the design ethic of modern arenas still borrows liberally from classical Greek and Roman architecture. 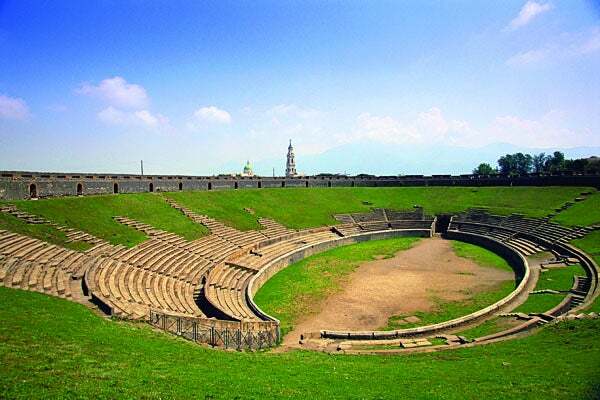 Improvement can come from studying sites like Pompeii, Still says, and then trying to balance the profit motive with some of the ancient stadium’s crowd management features that can significantly reduce the risk of often tragic and too-common security events—crowd disasters. Stampedes, crushes, riots. In crowds, trivial events can have tragic consequences. In a Chinese school last year, a child stopping in a stairwell to tie his shoe spurred a crush that killed six. The belligerent few can sway thousands of normally well-behaved individuals to riot, as soccer hooligans in Italy did earlier this year. Still shows video from an outdoor rock concert in which a few kids dancing fall down and cause, in seconds, a wave of hundreds of collapsing bodies, as if cuffed by the hand of an invisible giant. For a long time, the crowd itself, the mob mentality, mass panic, was inevitably blamed for disasters. But in the past decade, the science of crowd dynamics has undergone a broad philosophical shift, led by experts like Still who suggest that the mob mentality is a myth. Using computer modeling that combines a wide breadth of knowledge, from architecture and design to human physiology and psychology, Still has upended the assumption that the crowd causes disaster, and underneath that assumption he has found that it’s possible to manage the risk inherent in crowd dynamics and reduce the possibility of disaster. “It’s not a stampede, it’s a design and management problem,” says Still. “The stampede is the effect, not the cause. It’s an entirely predictable crowd dynamic. We can tell you what factors give rise to that behavior and how to engineer a system to limit it. Turn the page for a tour of Pompeii’s Anfiteatro, and what makes its design, from a crowd dynamics standpoint, optimal. Separate Queues from Promenades. Moving the bathroom and concessions next to the stadium instead of inside carried the added benefit of keeping those who were standing around separate from those who were walking to and from their seats. Good crowd management relies on keeping people moving at their comfortable pace of about 1 to 1.3 meters per second. Putting lines for the loo and for hotdogs in the same places where people walk creates clustering and disrupts that natural pace. This not only creates anxiety and frustration, but it also has a domino effect, creating congestion far away from the source, the same way it does on a busy road when cars accelerate and slow down. If modern stadiums aren’t going to separate the bathrooms from the venue entirely—and they’re not—Still says they need to create wider spaces around the perimeter that can be divided into a walking concourse and concourse for bathroom and concessions outside of that walking lane with broad entry and exits spaces between the two. Open Open Open! Here’s a challenge: Look for areas of Pompeii’s stadium where bottlenecks might occur, where the crowd could overwhelm a space. Still says you won’t find them. Seats are at the optimum viewing angle, and seating “packing densities are to comfort, not cost.” Again, Romans weren’t worried about ROI, but Still maintains that compromise is needed in modern facilities to reduce the risk of crowd disasters. At Pompeii, spectators would have at least twice the personal space in their seats as a modern fan. Stairways to the concourse present themselves at angles that keep people moving, and they’re as wide as the concourses they link to. On the side of the stadium where the city wall comes to a corner, there are no stairs, which would have forced people into tight spaces. Exits from the stadium to the palaestra, called vomitories, span the entire western side of the space, and that space itself isn’t blocked off at its north and south extremities. Instead, it opens to wide roads, allowing for people to spill out into the city and toward gates that leave the town. The combined effect of all these design elements, Still says, is palpable. “Physically it’s the same size as a modern facility, but the perception of space is significantly different. In a place like Wembley [Stadium in London, one Still has studied], you feel somewhat oppressed, closed in.” In Pompeii, it’s so open you feel almost insignificant but also part of the spectacle. To do this today, Still says, requires forethought all the way back to site choice. Often, he says, architects and planners put aesthetics (like a skyline or waterfront view) before safety as they try to shoehorn large venues into spaces that won’t allow for the kind of openness crowds need. Build a Big Road. Still suggests that designs for roads and walkways leading to a stadium consider the facility’s capacity. Ancient stadiums, notably Pompeii’s and an earlier great theater, Ephesus, met this criterion. It might seem an overly generous sidewalk until you realize that the capacity at Pompeii’s stadium roughly equaled the 30,000 population. Still says: “I imagine an entire city descending on the site,” then a generously broad thoroughfare starts to make sense. Still says newer facilities do this better than older ones, but urban facilities still struggle because of space limitations. Limit Corners. Modern stadiums often maintain the oval seating but then put blocky concourses around it. They also use switchback walkways and stairs. All of that creates corners. Corners force people to slow down and encourage congestion. Pompeii’s concourses were elliptical; few corners exist to slow people down. Still says this also evened out flow to the vomitories as people could, like liquid, choose the path of least resistance easily without interrupting their pace. Ironically, says Still, it could have been the limitations of their materials that caused Romans to adhere to this principle. They simply couldn’t build stone staircases into tight switchback configurations as we do with forged steel today. Still says architects should spend more time studying crowd dynamics to inform their design choices. Limit Options. In crowd management, the maxim called Braess’ paradox states that more options equals decreased performance. That is, if you give people many routes to choose from, crowd traffic will slow down because of indecisiveness and selfish behavior when choosing one of the paths. Pompeii provides a stark example of avoiding Braess’ paradox. The entire stadium is serviced by just six stairways, all of which point in the same general direction—northwest. By the time a Roman would have to make a decision which way to go, the space has already opened wide. Anxiety Control. A commitment to openness at ancient stadiums reflects an understanding of hard sciences like engineering and geometry, but Still believes it also reflects the ancient Romans’ understanding of human behavior. Openness reduces anxiety, and controlling anxiety is a cornerstone of crowd management. This combination of hard and soft sciences is what Still believes is lacking with many projects today. Still says facility managers “can shift the behavior of a crowd. Good signage and lighting, for example, will reduce anxiety. People need information before they approach the crowd. If one person has to ask where their seat is, then 140 people have to ask. Now there’s a backup and people are frustrated. Now those frustrated people sense disorganization and start acting out. Others take that cue and the anxiety feeds on itself. People say it’s the crowd’s fault. No. As the facility managers, you shape the behavior. Your failure to provide certain information or anticipate what creates problems, or to react properly when something does happen is what turns the crowd ugly.” In Pompeii, Still believes, Romans calmed crowds through design, even if they didn’t think of it that way. After all, a bad call by an official can spark a melee today. In ancient Pompeii, gladiatorial spectacles fed violence and death to a crowd full of men with swords.